The Imperial Romanov's Family's Silver Scroll - Rare Restoration Project in Progress. The Imperial Family's Silver Scroll, c.1913. 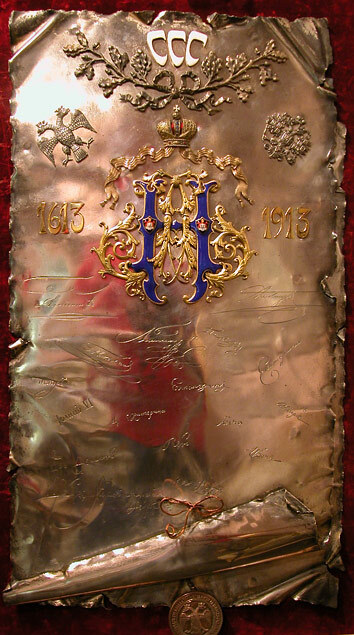 The Imperial Romanov's Family's Silver Scroll. Made by Peter Ovchinnikov, one of the most famous Imperial Russia silversmiths. Circa 1913, 32" x 16", 35lb. Private Collection, the scroll belongs to a family member of the Romanov Dynasty. Representing 300 years of the Romanov’s dynasty with the Byzantine two headed eagle on the left and the Russian Imperial two headed eagle on the right. Three Latin letters "C" Represent 300 years 1613-1913 of the Romanov’s dynasty. 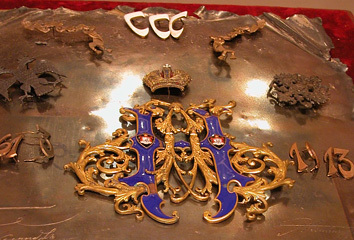 There are the initials of last Czar of Russia Nicolas II, made of Silver with dark blue translucent enamel and placed under Imperial Russian Crown emblem. 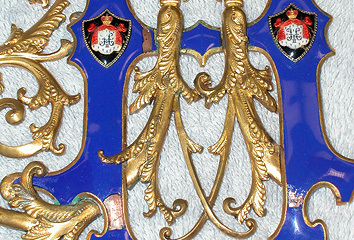 Emblem is made in gold, platinum, enamel and precious stones. Numbers representing years 1613 and 1913 made in gold. 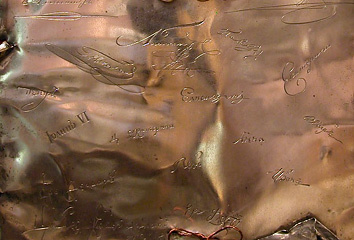 The lower half of the silver scroll covered by facsimiles of all Russian Monarchs of Romanov’s dynasty from 1613 to 1913 to the time of the Emperor of Russia Nicolas II, Rulers of Russia from 1613 to 1917. The name derived from Roman Yurev (d. 1543), whose daughter Anastasiya Romanovna was the first wife of Ivan IV the Terrible. Her nephews assumed the surname Romanov, and the dynasty began with the election of Michael Romanov as tsar in 1613. He was succeeded by his son Alexis (r. 1645 – 76), followed by Alexis's sons Fyodor III and joint rulers Ivan V and Peter I. When Peter was the sole ruler, he decreed in 1722 that the monarch could choose his successor, but he was unable to effect the law, so the crown passed to his wife Catherine I, his grandson Peter II, and Ivan V's daughter Anna. The line of descent returned to Peter's daughter Elizabeth (r. 1741 – 62), her nephew Peter III and his wife Catherine II the Great, and their son Paul I. Paul established a definite order of succession and was followed by his sons Alexander I (r. 1801 – 25) and Nicholas I (r. 1825 – 55). Nicholas was succeeded by his son Alexander II, grandson Alexander III, and great-grandson Nicholas II (r. 1894 – 1917), the last ruler of the Russian monarchy. At the bottom, Silver Scroll sealed by Russian Imperial two headed eagle Seal on the gold rope. 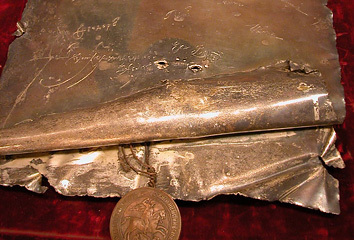 The Silver Scroll has Ovchinnikov hallmarks on the body and on the all major parts of the unique Master piece. All components of this marvelous composition by Master Craftsmen Peter Ovchinnikov disassembled, broken, some missing. 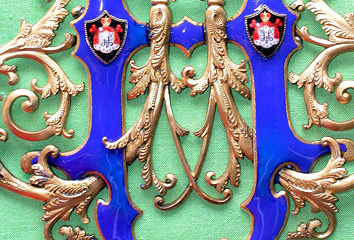 Blue translucent enamel, on Royal Initials badly damaged. Silver scroll oxidized and deformed. Gold Numbers 6 and 1 replicated in 18 carat gold (with adding copper to replicate the reddish old Russian gold color). 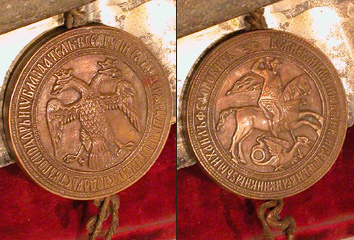 The ribbon on the right, next to "1913" replicated in "Russian" red color gold. 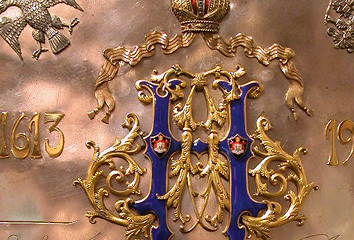 Fragments of enamel on Royal initial H (Russian N for Nicolas II) missing. Enamel reapplied by cold method enameling.